Get great discount on Transcend StoreJet 25M3B 2.5 inch 1 TB Auto-Backup Drive | Online India shopping best deals, discount,coupons,Free offers. Now store all your favourite movies in one device with this attractive light blue StoreJet 25M3B auto backup drive from Transcend, and flaunt your collection. 1 TB Capacity With a capacity of 1 TB, this portable hard disk has ample space to store whatever you want. Auto Backup This device has a special auto backup button that allows you to save files automatically and quickly. Durable This portable device has an advanced high-grade shock-resistant body, which makes it extremely durable. In-built Software Equipped with Transcend Elite Backup and Security software, this hard disk helps you manage data effectively and safely. 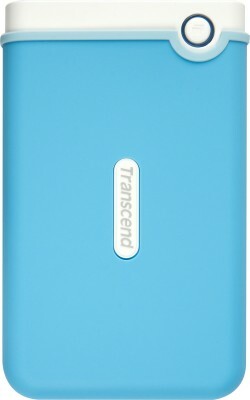 Compatibility This device is quite versatile, as it is compatible with USB 3.0 and 2.0..The product Transcend StoreJet 25M3B 2.5 inch 1 TB Auto-Backup Drive is from the famous brand Transcend. The product is currently available with the amazing discount from FlipKart.Currently a discount of 18.0% available for this product. Great discount for this product which has the original price of Rs.6000.0 and you get these amazing products for a discounted price of Rs.4875.0. Hurry up. Stock may be limited.